Yoga is the perfect activity for families with small children. The benefits of yoga include heightened concentration, greater physical strength and flexibility, and yoga can also be a bonding activity for parents and kids as well. There are some simple ways that you can turn this sport into a relaxing and fun activity for everyone in the family, including babies and teens. Yoga can be an intense sport for adults, but there are several ways that you can turn even the most complex poses into something the kids can enjoy. 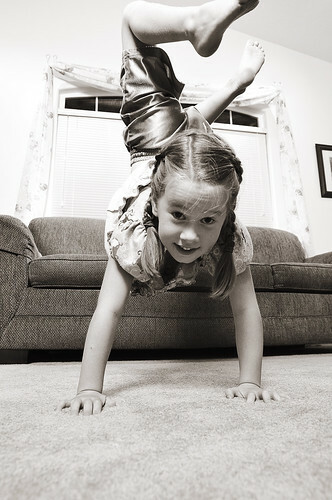 Opting to use kids yoga videos at home is one affordable option for families. There are now a wide range of videos for children and parents to use together as a family. If you have younger kids at home, you should not expect them to follow each move perfectly at first. Being relaxed about the activity and allowing your kids to play with the poses will encourage them to participate. Having fun with sports and family activities will help your kids build confidence and self-esteem while also building a lifelong love for healthy physical activities. Look for videos or classes that are designed specifically for kids and families to get all the benefits of yoga while making the instruction fun and interesting. If you have a baby under one, you can look for a video or class that allows you to interact with the baby while doing poses. Setting a scheduled time for yoga practice is also ideal. Some yogis think early mornings are the best time for yoga, and call this time the “Divine Time”. Anytime of the day is fine, however, so don’t force young children out of a sound sleep for practice to encourage a love of the activity. Many yoga poses are fun for kids because the poses can correspond to sounds that mimic the movements. For kids under the age of six, it is advised to keep the poses under one minute each according to Anmolmeta.com (http://anmolmehta.com/blog/2009/02/13/yoga-for-kids-children-yoga-poses/). All kids should be praised for their efforts, as well, even when they aren’t doing the poses perfectly. In fact, one of the best things kids can do is to simply close their eyes and feel the poses rather than trying to complete each action precisely. Eventually your kids will be able to do the poses without looking at the television or instructor, so keep things light and positive during the activity to ensure your kids are having fun. One of the benefits of yoga is that it helps kids to develop their creativity and imagination. Fun is actually built right into many of the poses that are designed for young children. Allowing them to complete the poses, movements and sounds in their own way is more important than any other aspect of the activity. Choosing an instructor or video that incorporates stories and other simple ways to explain each pose is also an easy way to get kids excited about yoga and to help them remember each pose in a sequence. Yoga is among the most beneficial of all exercises. Your kids can reap all the benefits while also having fun with just a little planning from you. Bio: Nicole Sullivan writes for Organic Baby Nook, an organic baby products guide for earth-conscious parents.